Velikost tohoto náhledu: 600 × 600 pixelů. Jiná rozlišení: 240 × 240 pixelů | 480 × 480 pixelů | 840 × 840 pixelů. English: Original Caption Released with Image: This processed color image of Jupiter was produced in 1990 by the U.S. Geological Survey from a Voyager image captured in 1979. The colors have been enhanced to bring out detail. Zones of light-colored, ascending clouds alternate with bands of dark, descending clouds. The clouds travel around the planet in alternating eastward and westward belts at speeds of up to 540 kilometers per hour. Tremendous storms as big as Earthly continents surge around the planet. The Great Red Spot (oval shape toward the lower-left) is an enormous anticyclonic storm that drifts along its belt, eventually circling the entire planet. 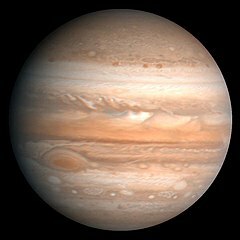 Suomi: Käännös alkuperäisestä kuvatekstistä: Tämän jälkikäsitellyn kuvan Jupiterista loi U.S. Geological Survey vuonna 1990 Voyagerin 1979 ottamasta kuvasta. Värejä on muokattu yksityskohtien parantamiseksi. Vaaleat, nousevat pilvivyöhykkeet ovat tummempien, laskeutuvien pilvivyöhykkeiden lomassa. Pilvet liikkuvat itään 540 km:n tuntinopeudella, länteen liikkuvien pilvimassojen nopeudet vaihtelevat. Mannerlaattojen kokoiset myrskyalueet kiertävät planeettaa. Suuri punainen pilkku (soikea kohde vasemmassa alakulmassa) on valtava pyörremyrsky, joka kiertää hitaasti planeetan pinnalla. Français : Cette photographie de Jupiter a été produite en 1990 par le U.S. Geological Survey à partir d'une photographie prise par une sonde Voyager en 1979. Les couleurs ont été améliorées afin de révéler le plus de détails possibles. Des zones claires de nuages ascendants alternent avec des bandes foncées de nuages descendants. Les nuages parcourent la planète en ceintures alternantes d'est en ouest, et vice-versa, à une vitesse de plus de 540 km/h. D'énormes tempêtes aussi grosses que des continents terrestres surgissent tout autour de la planète. La « grande tache rouge » (forme ovale en bas à gauche) est une énorme tempête anticyclonique qui glisse le long de sa ceinture, tournant perpétuellement autour de la planète. Tento mediální soubor byl katalogizován v Jet Propulsion Laboratory amerického Národního úřadu pro letectví a kosmonautiku (NASA) pod Photo ID: PIA00343. Tento soubor je volné dílo, protože obsahuje materiály pocházející od United States Geological Survey (USGS), agentury Ministerstva vnitra USA. Pro bližší informaci vizte oficiální licenční pravidla USGS (anglicky). This file was reviewed on 18. února 2011 by the administrator or trusted user Jappalang (talk), who confirmed the Public Domain status on that date.